Spring where did you go?! For me I felt like spring was well on its way and then suddenly it started snowing all over the country. We only got a tiny little dusting of snow that didn't stick at all but it was still bitterly cold for a few days making me dream of sunshine, ice creams and swimming in the river. Normally January is a very quiet month for people after all the Christmas rush and jollity but for me January was extremely busy with my wedding and so I've found my February to be more sedate. I spend a lot of my evenings wishing for warm weather so me and Russell can enjoy picnics by the Thames and moonlight swims again. I am also itching to start wearing my dresses with sandals and sunnies but for now I'm still pulling out the wooly tights. These photos were taken in a beautiful part of Oxford called Old Headington, not only full of beautiful houses made of cotswold stone, Old Headington also houses one of our favourite pubs ever The White Hart. Its a really nice place to go for a little wander together and get some serious house envy. Although we know we don't want to settle here and I have dreams of a little white seaside cottage up in Scotland, I can still appreciate how pretty the houses are round here and I definitely see why people would want to stay here even if it is rather pricey. 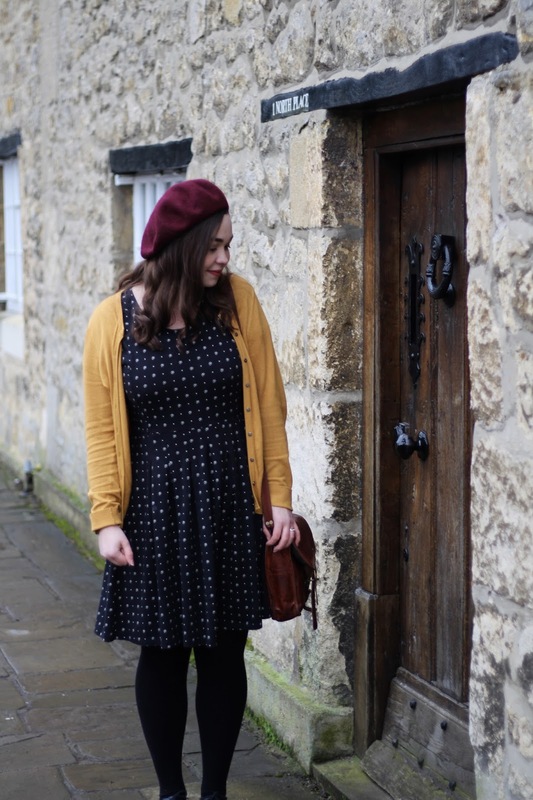 This dress is one of my old favourites that I bought last year from Fatface but I wanted to find a new way of styling it up. I always worry in winter I am wearing way too much black so I'm trying to inject more colour into my outfits. I have an array of berets in different colours that I bought when I went to Paris for the first time but I haven't made the effort to wear them with outfits. I decided if it was going to be so cold I'd dig out all my winter accessories and try to wear them a bit more before the Spring arrives. Having recently watched La La Land and absolutely loving it, I thought this outfit channeled Mia the main character a little bit and couldn't help but start prancing about the lamp post as soon as I saw it. I'm hoping that is our last bit of snow for this year and that soon I will see daffodils, blossom and green leaves everywhere. hello,ciao Rachel...nice photos and great outfit of yours..W the colours!...you bring the sunshine!